How do I Determine a Dog Breed by Physical Characteristics? 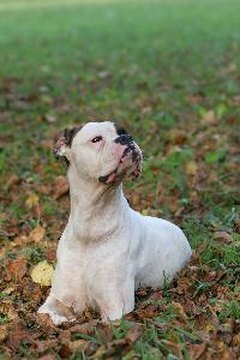 The Boxer, a short-haired, medium-sized breed, is often mistaken for a "pit bull"-type dog. Identifying a dog breed based solely on physical characteristics can be extremely difficult. Many traits are shared among multiple breeds and breed mixes. In areas that ban certain breeds, many dogs have been removed from their homes or even killed simply because they look like a banned breed. General size can sometimes give a clue to a dog's breed, although any specific parameters are bound to be arbitrary. Size can help determine the difference between, for example, a miniature pinscher and a Doberman pinscher. Substance can help narrow down your breed selection by group; a dog that naturally is quite thin might be a sighthound, such as a greyhound or saluki. Coat colors might rule out certain breeds of purebred dogs; you won't see a brindle Labrador, for example, or a black samoyed. The length of the coat might be the main difference between two breeds, as with the greater Swiss mountain dog and the Bernese mountain dog. Likewise, some breeds differ primarily in coat type, as with the German short-haired pointer and the German wire-haired pointer. Sometimes the same breed will have multiple coat types: the dachschund, for example, comes in smooth, longhaired and wirehaired varieties. With many breeds, head type is the distinctive trait. Muzzle length and width generally falls into one of three categories. Dolichocephalic muzzles are narrow, and more than half the length of the entire head, such as in borzoi and whippets. If the muzzle is about equal to half the length and width of the head, the dog is considered mesocephalic, such as the Alaskan malamute and German shepherd. Brachycephalic breeds, such as boxers and Pekingese, have muzzles that are shorter than half the length of the head and relatively wide. In some cases, the length and thickness of the ears or tail might give a clue to the dog's breed. Bulldogs have small ears and a curly tail, while the ears of a basset hound nearly trail along the ground. The thick tail of a Newfoundland acts as a rudder when it is in the water, and the Irish water spaniel has a long, thin "rat tail" that can help distinguish it from a standard poodle.